Mansfield Town striker Shaq Coulthirst will have two front teeth in place for Saturday’s trip to Morecambe after a trip to the dentist this week to put back in the one that was knocked out in last weekend’s 2-0 home win over Carlisle. 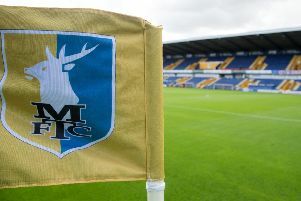 Stags boss Steve Evans was incensed by the challenge that caused it, but as Evans was already serving a one game ban for abuse of the officials at Grimsby, he ended up having to bite his lip. He said: “It was a red card. You know that and I know that – but the referee’s missed it. That disappoints us. “The other referee missed one at Grimsby and I ended up getting into trouble for that one, so I thought I’d better not mention this one to the referee or I might be in trouble again. “They were both elbows, both off the ball and both late and dangerous in the face, both on the same player. “Shaq’s got his tooth and he will see a dentist tomorrow he tells me. “Some players would buckle under that. They’d have a tooth out and their game would go to pieces. But Coulthirst’s response was fantastic.